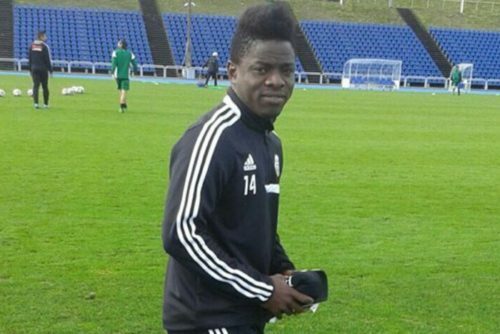 Will Sweden deport gay Liberian refugee to his homophobic homeland? He traveled to Sweden to play soccer, but stayed for love. Now, openly gay footballer Andrew Nagbe is asking for asylum after being arrested by immigration officials right in the midst of Stockholm’s Pride parade. The 22-year-old, who was celebrating Pride with his boyfriend at the time of his arrest, is a refugee from Liberia, where being gay is against the law and punishable by imprisonment. It’s a fate Nagbe reportedly fears is certain, if Sweden goes through with its threat to deport him. “I want to play football and live as an openly gay man in Sweden,” Nagbe told the Swedish newspaper Dagens Nyheter, according to NewNowNext. But even though he’s been doing just that, playing for third and fourth-tier teams, and dating another man, NewNowNext notes that officials “maintain that Nagbe’s claims to be both gay and that he would have his safety compromised if he returns home are not verifiable,” according to the Swedish paper. And reports say the only Nagbe will be able to appeal the ruling is by presenting new evidence to show he is in fact gay and faces certain imprisonment upon his return to Liberia. The Scotsman reported that at the time of his arrest, Nagbe was playing for Södertälje FK in the fourth tier, a town to the south of Stockholm where many immigrants have settled. Unless the club can find a way to win his release, Nagbe is set to be deported August 23.